He feels the need - the need for speed. Strong and agile, Kopaka soars through the sky on his high-tech wings. 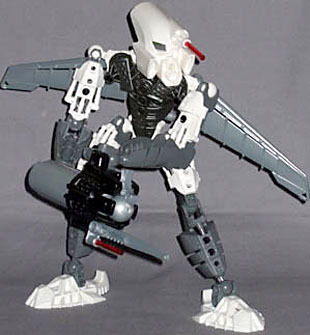 Armed with his Midak Skyblaster tipped with an ice bayonet and Mask of X-Ray Vision, he is ready for serious combat in the air. That's right, serious combat - not the jovial, prank-laden aerial slaughter Toas Pohatu and Lewa prefer. Don't you just hate it when you pull a high-g turn to get a bead on your enemy, only to find that some twit's replaced your air-to-air missiles with bananas? Happens on Karda Nui all the time; they're probably some kind of bio-mechanoid bananas, of course. With his spotless white armour over sleek gunmetal-grey body, his bulky air-filter-adorned helmet, and of course his wings, Kopaka looks like the result of a Top Gun pilot impregnating his own strike fighter. He's high-contrast all over, especially the chestplate, which is a cool-looking highly reflective grey, creating stark relief between the light on its edges and the deep shadows in its recesses. Apart from the wings, he's just a standard Toa, with nothing fancy about his proportions or construction (so the usual joint layout: balljoint neck, shoulders, elbows, wrists, hips, knees, ankles), but he looks badass. 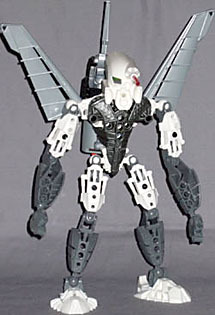 The wings, mounted either side of the omnipresent Matoran connector, are quite nifty. Instead of just plugging into the back, they're mounted on short X-rods which plug into the heads of three-length plugs running through two layers of the torso - translation, they're very stiff to turn, and can be relied upon to hold their position no matter where you put them. At rest they sit with their inner trailing edge against the connector "backpack," swept back roughly 45°, but they can go up to fully vertical, for a kind of "land mode." As a bonus, the skyblaster can slot into the connector between them for when it's not being used. Kopaka's Mask of Superman Sight is a strange-looking thing (though very much in keeping with his prior incarnations, I gather), with one eye covered entirely by a bulky targeter kind of gizmo, with a lightsaber blade/laser sight sticking out of it. Hopefully it's got a stereoscopic head-up display built in, since otherwise he'll have no depth perception, which is not something you really want to be dealing with when you're in aerial combat, especially not if it's the kind of combat where a bayonet is a viable weapon. Said bayonet is fitted to the Midak skyblaster, the standard Toa weapon for Phantoka, a rough and rugged four-shot sphere launcher that'll reliably knock any toy up to and including a 12" G.I. Joe to the floor in dismal defeat. It's also got another laser sight, just for kicks - maybe it links up to the helmet one, so Kopaka sees where his weapon's aiming at all times. Makes you wonder if he ever "accidentally" leaves it in the Toa Nuva shower block when Gali's around. The only problem with the skyblaster is that Kopaka's elbows only have about 90°" of upward bend in them before the bicep armour gets in the way, which makes it tricky to get him holding the weapon close beneath himself facing upwards, as he would to aim ahead during flight. Simple fix, move the bicep armour to the back, which makes sense for an aerial fighter who might come under attack from above. Kopaka's Matoran buddy is Solek, and they're not actually a bad pair. Since they're intended as a pair their colours and designs match up, and although Solek's bulky mask (echoing Kopaka's) can get in the way a bit when you're trying to get him to look over Kopaka's shoulder, his long scimitar blades look like they'd be pretty useful in a dogfight, since hand-to-hand is apparently involved in air war where these things come from. 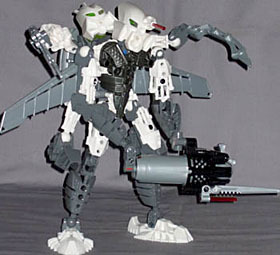 He's a good toy, is Kopaka, and probably the best expression of the "sky warrior" idea of Phantoka. Given a couple of minor modifications, like the bicep armour, and removing the Matoran connector so the wings can swing right back for a dive, he's pretty much flawless.